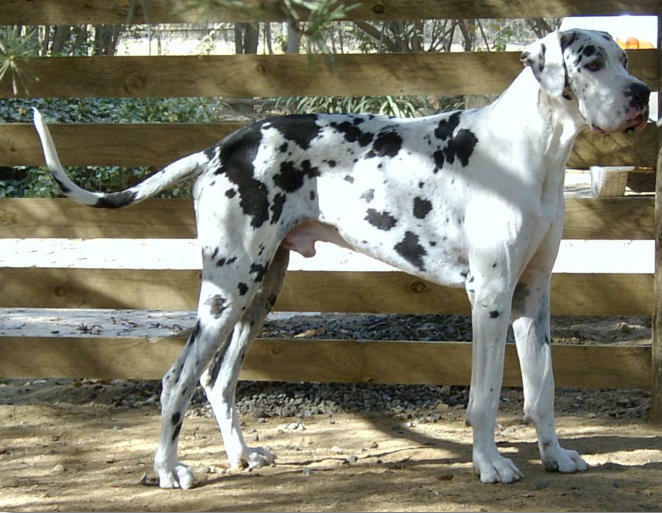 • Sire : RBISS Ch Cherriton Granite HD00 ED00 • Dam : Ch Saxony All About Colby at Chezenko HD00 ED00 • Bred by : Dr's Vicki & Tony Reid of Chezenko Great Danes, Johannesburg, South Africa Cash was a wonderful boy who was taken from us far too early. His life was brief yet very bright and his "monkey behaviour" always brought a smile to my face. Tragedy struck just after Cash’s second birthday. He was playing in the garden with my daughter and she suddenly screamed that Cashie had collapsed. By the time I got to them he was already gone. My daughter is now 21, but we both remember that horrible day so clearly. Cash’s untimely death (due to DCM) was not in vain. We since implemented a number of new procedures, which will hopefully prevent this from ever happening again. Cash sired the Saxony F litter, which occurred prior to his health problem being exposed. Fortunately none of his offpsring suffered the same condition in such a severe form. In limited showing Cash notched up three CC’s. Cash would either show like a dream or decide to imitate a min pin in the ring! He had me in stitches on numerous occasions at home, but I often left the ring with a red face while Cash was grinning from ear to ear. It’s funny now. I was hoping to finish Cash's championship once he had matured, but we never got the chance. Cash appeared in two adverts and was such a star during the shoots. He was the consummate gentleman with not a mean bone in his body.